Stephen, got my item. Thanks mate, it works a treat! Cannot thank you enough for your product, service, delivery time and feedback, they were all excellent. Thanks again. Advanced engineering brings a lighter cable, with moulded plugs, high-specs and a protective nylon jacket. Complement your home theatre with a rugged, high-performance HDMI cable. Avencore Platinum Series HDMI cable delivers the best possible audio and video signals in an easily managed light gauge solution. It's High-Speed with Ethernet and 4K ready - great for any home theatre or PC! Pairing the latest HDMI v2.0 hardware with an Avencore Platinum Series HDMI cable will deliver the ultimate in Ultra High-Definition video and multi-channel audio. 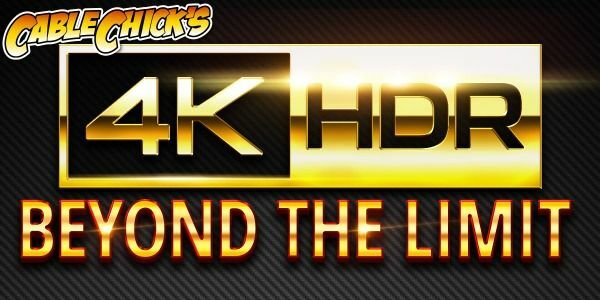 Features like HDR, 32 Channel Audio, 3D and Dual View streaming are all possible, along with all the previous HDMI abilities such as ARC, CEC, Deep colour and more. 4K UHD at 60Hz is also a snap! The cable itself features a moulded plug barrel and extruded anodised aluminium shell for a mighty balance of strength and style. Nylon braiding covers a PVC jacket for extra protection in all installation types, while Gold plated contacts help prevent corrosion and ensure a strong signal. Great in any home theatre as well as offices and light commercial settings, the Avencore Platinum Series HDMI cable works with all HDMI hardware versions and all source and display types, including Blu-ray players, media streaming devices, computers, laptops, games consoles, televisions, projectors and many more. Latest HDMI 2.0 High-Speed with Ethernet Compatibility! Four Screened Twisted Pairs of Aluminium Wrapped Oxygen Free copper plus foam PE insulation. Did you know Cable Chick also stock Gaming Gear? I've placed two orders for cables to set up my man-cave in the last two weeks. The email communication about the progress of my order was excellent, the products were dispatched quickly and both times I received the items the next day! Cable quality is excellent too! My first order was for some short HDMI cables to wire up my home entertainment system and I was more than happy with the packaging and quality of materials. In my second order, I bought two 10m cables, a TOSLINK and a HDMI cable, and both have performed perfectly even though I had been told by the retailer that 5m was the limit unless I used a repeater. Well boo-yah to them because it worked as advertised. Thank you Cable Chick, I'll be buying all my cables from you in the future! I bought the Quality 3-Port HDMI Switch with Remote and 2 x 50cm Pro Series HDMI Cables from Cable Chick. Firstly, thanks for the amazingly prompt delivery! For the service to be any quicker you would have to guess what the customers want! I installed the switch last weekend. Thankfully the device being as small as it is allowed it to fit exactly where I wanted it. Installation was simple and I could see no deterioration in the quality of the TV image. Im completely satisfied with both the quality of the product and the service from Cable Chick and am already eyeing off some other items Im likely to need. Happy to recommend the company to anyone. I recently purchased a top of the line 1080p projector for my home cinema and was in the market for some good quality HDMI cable. I found Cable Chick via Google and upon further research, found nothing but positive reviews for their products. I settled on the Pro Series 15 metre HDMI Cable, which I have now routed in my wall cavity and the picture quality is absolutely flawless, even at such a long length. I ordered my cable on Easter Monday (which was also a public holiday) and had the cable on my doorstep by Wednesday morning. This kind of delivery (which was free!) from across Australia is nothing short of amazing. I simply cannot be more positive about Cable Chick  an extensive range of products to suit all budgets, super quick delivery, and overall a very pleasant experience. Highly recommended and definitely a new customer for life. Thanks Cable Chick! In dealing with business that sell items over the Internet, a number of criteria are to be considered. For example, is the item being sold comparable in cost to the same one on other Internet sites or in shops? Does the quality of the item measure up to the product information on the web site? Did the product arrive undamaged and does it actually work? And how long does it take for the product to arrive? The Pro Series HDMI Cable I recently received from Cable Chick more than meets all these criteria. The item arrived in mint condition at a cost as good as I could find elsewhere and there is a distinct improvement in the screen quality of the DVDs on my 42 LCD television. Remarkably, I ordered the cable in the afternoon and it arrived the following morning! Until teleportation of solid goods is invented, this is as good as it gets. I recently required a HDMI cable and was quoted $200 from a Harvey Norman store. I found Cable Chick online and started my own research. I rang the office to confirm some technical points and was very impressed with the honest advice. I purchased the same quality product as well as an Optic Fibre cable and had them delivered the following day for a total of $77. I live 2000 kms from their office so this was great. I was extremely impressed and have already started looking into other cables etc that I need. I wont buy from anywhere else now. for at least making one element of the building process really easy ! I tripped over the Cable Chick web site by accident, I had just bought a surround sound system and was one HDMI cable short and didn't really want to outlay another $190.00 for a metre long cable. So I Googled HDMI found the Cable Chick web site, called your office to get info on what I should get and was given brilliant service, and my new "two metre" long cable arrived the next day for $65.00! I now need a coaxial cable so I will be ordering that today. Keep up the great work, you've got a customer for life! I must say I was more than impressed with your rapid response when I purchased a Pro Series 2m HDMI Cable - in fact it was too quick as we went away the day after I ordered my cable which happened to be the day it was also delivered. As no one was home I had to arrange for the courier to re-deliver which wasnt a problem but I will keep in mind how quickly you respond. These days we are conditioned to expect things to take forever to be delivered with all sorts of hassles. I will recommend you to anyone who wants a quality product delivered to their door in record time. Cable chick rocks. I live in Melbourne and use CableChick regularly, mostly for unusually long specialty cables, The last ones were two 10 metre long DVI-D cables from my computer ( in the next room) to my lcd screens. And they work great too. On Monday night a friend sold me his hi res cinema projector and brought it around. It¹s 720P and he got a new 1080P. My old 480P projector was connected with a component cable some 18 metres long. This new projector had an HDMI input and that was what I wanted as it gives me the best possible resolution. Monday arvo before I even got the projector I surfed over to Cablechick.com.au and ordered a 20 metre HDMI Pro cable. In the meantime I connected my projector up with the existing component cables and it looked pretty average. Well I didn't have to wait long to find out the difference the new cable would make. The new 20-metre HDMI cable arrived the very next day from Bulimba QLD. I¹ve been very happy with the result. Answer: "Yes, this cable is capable of achieving those resolutions up to 1080p." 100+ In Stock Ships by 4PM Today! A HDMI Cable for the astute buyer. The Avencore Platinum Series HDMI lead brings you all the latest features you'd expect from a quality High Speed + Ethernet HDMI cable, delivered with the the looks of a super-model. Anodised plug grips and Nylon-over-PVC jacketing make for a hard-wearing cable, while quality internal materials guarantee compatibility with all the latest HDMI v2.0 hardware. Thank you. Received my order very promptly and the cable works perfectly. I've had none of the problems other people have reported using cables from other suppliers - the Cable Chick cable is brilliant. wow!!! At 15m the quality needs to be there, with this cable the picture at the receiving end is as good as if the cable was only 1m. Great job Cable Chick!